Flowing, inventive, fresh, creative, full of life and quiet joy. An oasis of peace in a desert of noise. Keyboards, perc., guitars, exotic instruments provide a restoring soundtrack for your life. "Restful Waters" is inspired and inspiring. Fresh compositions with David's signature musical style, his jazz-influenced Spirit-filled creations evoke healing streams, green pastures, lush mountains and fragrant tropical gardens. This music provides an opportunity to the listener to escape the noise of everyday life and come to the Instrumental Oasis. It's a short journey- just put on the CD or your earplugs and relax, dream and be refreshed with "Restful Waters." This solo project that David Baroni has recorded features not only his creative piano playing but the listener will also enjoy his bass playing, guitars, percussion- even the African banjo on "Sons and Daughters Of God." David has been inspired by musicians and groups like Dave Grusin, Bill Evans, Pat Metheny Group, Weather Report, Joe Zawinul, Jaco Pastorius, George Winston, Jim Brickman and Bobby McFerrin. 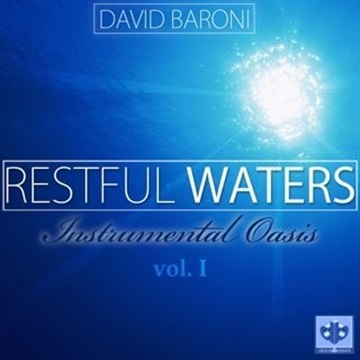 David Baroni allows the Holy Spirit to flow through him in these spontaneously inspired songs. Come along for the journey, you will be glad you did! All songs composed and performed by David Baroni.